Sanders, however, is not the first American of note to make the transition from democratic socialism to identifying with the Democratic Party. A century ago, poet and future Lincoln biographer Carl Sandburg did something similar. For at least a decade, from 1907 to 1917, Sandburg considered himself a socialist, and strongly defended Socialist Party positions until he split with most socialists in 1917 by supporting President Wilson’s decision to go to war with Germany. Yet in the 1920 presidential election he still voted for his friend, the Socialist candidate Eugene Debs, whom Bernie Sanders regards as one of his political heroes. Only later, though Sandburg never joined another political party, did he become a strong champion of various Democratic presidential candidates. Yet, despite his earlier decade-long affiliation with the Socialist Party, Sandburg came to be recognized as one of our greatest Americans. Consider all of the accolades showered upon him. In 1940, after President Roosevelt (FDR) heard a rumor that Sandburg might run for a Congressional seat, he encouraged Sandburg, stating “it would be grand to have your kind of Lincoln liberal in the Congress.” That same year Sandburg’s six-volume biography of Abraham Lincoln won him the Pulitzer Prize for history—in 1951 he was awarded the Pulitzer for poetry. In 1959, the 150th anniversary of Lincoln's birth, Sandburg spoke of Lincoln to a Joint Session of the U. S. Congress. He was the first private citizen to address such a session in the twentieth century. For JFK’s 1962 book To Turn the Tide, the president invited Sandburg to write the Forward, which the poet did. In 1964, President Johnson (LBJ) awarded him the Presidential Medal of Freedom. But just as important as all the later acclaim heaped upon Sandburg are the reasons he supported democratic socialism in the first place. In the early twentieth century women and most blacks were denied the vote; most of the latter lived in segregated conditions; unions were weak and workers had few protections; Social Security and minimum wage laws did not yet exist; very few workers received pensions, and child labor and unsafe working conditions were widespread. 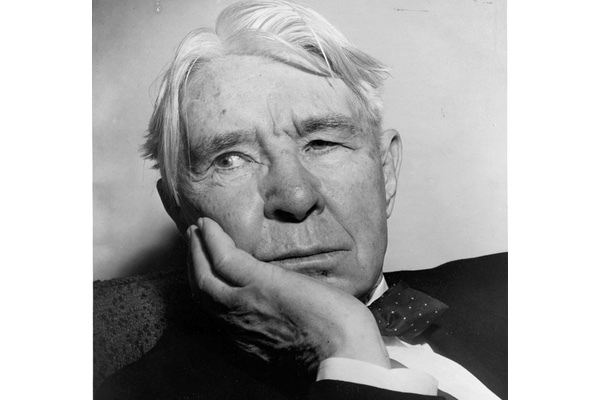 Sandburg came from working-class, Swedish immigrants; his father was a railroad worker in Illinois. Son Charles (later changed to Carl) served as a private during the Spanish-American War of 1898. In the early twentieth century he read much on radical politics including works of Marx and other socialists and liked the writings of the socialist muckraking critic Upton Sinclair. In late 1907 at the headquarters of the socialist Social-Democratic Party in Milwaukee, Sandburg met his future wife Paula. He was a paid organizer for Wisconsin’s Social-Democratic Party; and she helped the party out by translating German socialist writings. She encouraged him not only in his practice of writing poetry, but to become “the socialist poet.” In 1908 his “You and Your Job” pamphlet bore a Socialist Party imprint. Around 1910, he began working as the private secretary of Emil Seidel, the socialist mayor of Milwaukee, who in 1912 became the vice presidential candidate for the Socialist Party in the 1912 presidential election. During the years 1915-1918 Sandburg wrote articles for the International Socialist Review. One politician he wholeheartedly supported in the 1930s was FDR. In 1933 he indicated that he saw “many striking parallels between Lincoln and Franklin Roosevelt.” In 1935 he wrote to President Roosevelt “that you are the best light of democracy that has occupied the White House since Lincoln.” Strongly supporting FDR’s New Deal, in 1936 and 1940 Sandburg gave various speeches encouraging Roosevelt’s reelection. Aware that many people were critical of FDR for moving toward war against Germany, Sandburg defended him, saying: “Who wants war? Nobody. Only fools and idiots want war. . . . Yet sometimes the issue comes before a nation of people: Will you fight a war now, or would you deliberately choose another later inevitable war.” During World War II he supported, in a weekly columnfor the Chicago Times syndicate and in foreign broadcasts for the Office of War Information, the war effort and President Roosevelt’s endeavors. In the 1950s, Sandburg backed the presidential candidacies of his friend Adlai Stevenson. In 1960 he campaigned for JFK. Besides his poetry, two other examples illustrate well his continuing sympathies. During WWII, when over 100,000 Japanese-Americans were placed in internment camps, he hired two Japanese-Americans to work for him and wrote a column warning against ethnic prejudice. In theearly 1950s, as Senator Joe McCarthy was stirring up flames of intolerance and suspicion of foreign ways, Sandburg collaborated with Paula’s brother, the photographer Edward Steichen, to put together an exhibit of over 500 photographs, gathered from almost seventy countries. It subsequently became the most viewed photographic display in history and the basis for the extremely popular book, The Family of Man, which reproduced the photographs. In 1959, the two men accompanied the display to Moscow, hoping it would further understanding among Cold War rivals. Thus, what led Sandburg to first embrace democratic socialist ideas were noble ideals and compassion, and he retained those sympathies when he transformed his allegiance to Democratic leaders whom he thought were moving the party in a more progressive direction. But the mature Sandburg was never an ideologue. Bernie Sanders has taken a somewhat similar journey. Like Sandburg, he has never deserted his youthful ideals, but hopes that the Democratic Party can continue to evolve and manifest more of those ideals. He is no more a blind follower of some foreign socialism than was Sandburg. And to suggest that his thinking is somehow “un-American” is as nonsensical as it would have been to pin that label on Sandburg’s earlier socialist sympathies.